What if we could track where the cancer is moving through the body, not by evasive biopsies, but rather through a common procedure we go through nearly anytime we visit a doctor. A simple blood draw. That's just one of the innovations I discussed with Dr. Peter Kuhn. It was a terrific conversation. Dr. Kuhn is not your typical researcher, part scientist. Kuhn's a physicist by training and part entrepreneur. That mix of disciplines comes across in how he thinks and how he approaches his work. It clearly drives his unique approach to helping find a breast cancer cure, not to mention the 16 patents that have been filed as a result of his research. Some background. Dr. Kuhn is the Dean's Professor of Biological Sciences and Professor of Medicine and Engineering, as well as a founding member of the Michelson Center for Convergent Bio-sciences at USC. He's a founding member of a new institute of convergent sciences and Director of the Southern California Physics Oncology Center. Dr. Kuhn has been a BCRF investigator since 2013 and is currently supported in part by the AutoNation Cure Bowl Award. Dr. Kuhn's research is shedding new light on how cancer spreads through the body and evolves over time. Chris Riback: I'm Chris Riback, this is Investigating Breast Cancer, the podcast of the Breast Cancer Research Foundation and conversations with the world's leading scientists studying breast cancer prevention, diagnosis, treatment, survivorship and metastasis. Some background. Dr. Kuhn is the Dean's Professor of Biological Sciences and Professor of Medicine and Engineering, as well as a founding member of the Michelson Center for Convergent Bio-sciences at USC. He's a founding member of a new institute of convergent sciences and Director of the Southern California Physics Oncology Center. Dr. Kuhn has been a BCRF investigator since 2013. Dr. Kuhn's research is shedding new light on how cancer spreads through the body and evolves over time. This new science should lead to a personalized care strategy that is biologically informed and clinically actionable. Before my conversation with Dr. Kuhn though, one last item. An ask from me to you. I hope you like these Investigating Breast Cancer conversations and if so, I'd appreciate if you'd take a moment, go to I tunes and if you're so moved, leave a five star review. The ratings really matter. They go a long way to helping other people find the podcast. Thanks for considering. Okay, that's it. Here's my conversation with Dr. Peter Kuhn. Dr. Kuhn, thanks for joining me. I really appreciate your time. Dr. Peter Kuhn: Chris, great to be with you. Chris Riback: So I see that you have filed for at least 16 patents as a result of your studies. Before we get into the science and everything that you've done on the research side, I just want to know, should we expect to see you on the television show Shark Tank at some point? You may not ... I don't know if you've ever seen the show, but they go crazy for entrepreneurs with patents. Maybe we can get Mr. Wonderful to fund some of your work. Dr. Kuhn: Right, so I have to admit that I have not owned a TV for the past 25 years. So I'm not quite qualified to directly answer that, but I can tell you one thing, if going onto a TV show will improve our chances of making a difference in outcomes for women and men with breast cancer, you will find me on that show and that is the same reason of why certain parts of our work we do file patents because we believe that they can actually make a difference and in order to make a difference, you have to make it viable, sustainable, and bring it to the patients. And that's the mechanism to do so. Chris Riback: Well, that's terrific. And there's no doubt the impact, the positive impact, that you've made over the last 25 years. There's nothing on television that we need to watch that compares with what you and other colleagues of yours have done, so that's great. We all benefit from the fact that you're not using your time like the rest of us are. You're using it to actually go save the world. So thank you for that. So let's start with the broader context. What are precision medicine and what is personalized medicine? How would you characterize your work and would you characterize it in a sense as trying to enable personalized medicine at scale? Dr. Kuhn: That's actually a very good way of putting it. Personalized medicine at scale because obviously every patient physician interaction today and ever since that interaction started is personalized because every physician is having a personalized relationship with that patient. However, that relationship and the actions resulting from that are always limited by today's state of the art and our goal really is to extend that state of the art to really go to a place where science can actually directly inform that personalized interaction between the patient and the physician. Call this higher precision, call it higher accuracy, but it's really the personalized brings accuracy meaning it's better on target and the precision brings you reproducibility and I guess that is what you refer to as taking it to scale. Making it reproducible for everybody in this country and around the world. Chris Riback: That is what struck me as I was reading about your research and about you and another thing that struck me is, I guess, the context and so make sure that I've got this right, please. So a person has breast cancer and a particular therapy is diagnosed, but that's just the beginning. Cancers can change and as a result, therapies may need to change. Explain, if I have that right, explain if you would that process and then maybe how you fit into that process because as I was going through some of your research, it feels like an important part of what you do is you're there as the cancer changes and as the therapies change and you're really helping folks recognize that as it's occurring in a much faster way than maybe we've been able to do that in the past. But talk to me about that process. Dr. Kuhn: Absolutely right. So cancer is a disease of self, right? So it evolves in the individual patient. It starts at some point and then it evolves over time. In fact, many of them would actually evolve in a fairly benign way and might never harm the patient and others evolve to be much more aggressive. And those two are the more aggressive and the less aggressive one, have to be treated differently from the very beginning, but then they also respond to what we call treatment pressure. Meaning I am now doing something to the cancer and the cancer will start responding to that in the context of that individual patient. And this development over time, we have to be able to watch and then respond to appropriately. So we often times, we now start thinking of episodes where you get diagnosed with breast cancer at a particular stage with a particular set of features; descriptions that we give that cancer and that results in a certain decision-making about how to treat that particular patient and then we watch. And we watch to see whether the patient actually responds, whether the cancer responds, goes away and then stays away or stays at a much lower level. So often times in metastatic breast cancer, today actually, treatments can be pretty effective over a reasonable period of time. And we want to make sure that we catch when it starts coming back as early as possible. Again, for most patients hopefully it will never come back, but that uncertainty is always there. So in those cases we actually are aiming at providing certainty around it not coming back and for those cases where it does come back, we want to catch it as early as possible and then figure out what's the phase of that cancer as it's coming back. Is it the same as it was when it was originally diagnosed or does it, in fact, look different? Do I now need to treat it differently? And that marks then the end of that first episode. We now go into the second episode. The cancer might have changed. Treatment might have to change. We are now treating. We want to watch whether the cancer responds as we expected it and we're going to watch it now again, over a certain period of time. Hopefully as long as possible and want to catch it again when it starts coming back. Whenever that may be, that's the next episode. And it's that framework that we're trying to understand. Chris Riback: I'm thinking about the patients as they go through that and on the one hand, I imagine it cuts both ways. On the one hand, there must be stress as a cancer re-appears or changes or evolves. I mean, obviously to say the least. That cannot be something that folks are wanting to hear or wanting to happen and yet at the same time, comfort may not be the right word, but added hope or strength from being able ... from a doctor or a physician ... able to help them identify what is going on. So the fact that a change has occurred or something has come back clearly not good news to say the least and yet the ability to identify it, then presents the opportunity to act on it. Is that right from a patient's point of view? Do you see that range of kind of emotional reality and reaction or does it work differently than that? Dr. Kuhn: No, no, that's exactly what it is and in many ways this for me actually goes back by over three decades now when my mom was originally diagnosed and I can tell you that even today, just three weeks ago she had x-rays done because her hips were hurting and obviously just inflammation because she had just twisted it wrong. So entirely an orthopedic issue and it wasn't until 10 days later that she talked to me on the phone and she's like, "You know what? There was just this nagging voice in me that asked a question of is it back?" Right? So this stress and the anxiety I think stays with most patients. Whenever they get diagnosed and so the real question is what is it that we and the sciences need to do to really give confidence in the current diagnosis and give confidence in the future? No matter what that future might be. I believe that the most important thing that we keep hearing about not just me from my mom, but that we keep hearing in the conversations that we as scientists have with patients is really that they want to have more confidence in their own future. And that is true for both, for those who will most likely never recur and for those who actually have a real risk of recurrence. And we do see a lot of both science, as well as on this whole companion diagnostic development pushing forward with that to really support that part of that clinical journey. Chris Riback: Well, and it make sense in reading about the way your lab is set up and your background as well. It's not surprising to me to hear that you kind of take a multi-disciplinary approach. That you look at it from multiple perspectives. And we'll talk about that. I want to ask you about that approach and the set up of your lab, but first on this point of really being able to check what's going on and helping to address the latent concerns that your mother voiced and that many patients have. What is a liquid biopsy? Dr. Kuhn: So when you think about how breast cancer is currently being diagnosed, it is typically the result of either a screening or an accidental finding of a lump. That is then followed by a biopsy meaning a needle that gets stuck into the breast to extract a piece of tissue. The pathologists then do their diagnosis under the microscope and then that is followed with the initial treatment decisions. May that be surgery for disease that's confined to the breast or systemic therapy for those patients who actually are being diagnosed with a node of metastatic disease. After that initial treatment, that definitive treatment that happens fairly quickly, the question is now how do we watch it? How do we watch both the patient and the cancer as things happen or don't happen over time? And, obviously, it is not feasible to stick a foot, foot and a half long needle into somebody's body every couple of months, but in fact, drawing a tube of blood every couple of months or every couple of weeks, that's entirely doable and as we know from the leukemia, lymphomas even taking a bone marrow aspirate on a reasonably regular basis is actually perfectly viable. So we have ... if we draw blood, we have something that's doable. That's acceptable. The question then is would we find relevant information in the blood. Then that relates back to the actual disease and one can very easily imagine, right, that the disease, if it's completely confined to the breast itself will actually not really lead to lethal disease, but if it's completely and truly confined to the breast one can surgically resect, locally treat it and it's all good. However, for disease that is more aggressive, meaning it has ... that the risk of becoming widespread or what we call metastatic disease, the mechanism, the process that is behind this spread always involves the blood circulation because the blood is your major highway through the human body. And that means that, of course, from a scientific perspective the blood would be a great place to understand the disease as it's either trying to spread through the body or as it has spread through the body. So that means that we have something that is clinically acceptable, meaning I can do blood draws and something that is scientifically well supported, meaning the spread of the cancer happens through the circulatory system. So the liquid biopsy is in most cases, simply a blood draw. In other cases, it might be any other bodily fluid. Chris Riback: And how easy or difficult is it to find, I guess, what is known as the circulating tumor cells in the blood? Which, I guess, is what shows you whether ... is one of the indicators perhaps of whether the cancer is metastasizing. How easy or difficult is it to find those circulating tumor cells? Chris Riback: Forgive me, that's slightly more aggressive than I would want to be with you, but now that you've opened that door... we're all waiting. I mean, [we know] you're not wasting your time watching television, what's taking you so long, man? Dr. Kuhn: That is an absolutely fair question because it's been a long time when Ashworth actually first found these cells in the circulation. At the time there was no digital anything. This was in 1889 when he first found cells in the blood of a patient who had died from cancer that looked similar to those found in the primary tissue. So this question is very fair and it relates to the following: these cells are rare events. They are a needle in a haystack events. These are cells that have escaped from the tissue itself. Either the primary tissue or the metastatic tissue that travel through the blood at an unknown frequency. And, obviously, they adapt to the blood in certain ways that we don't understand. So now you have a rare event that you don't even know exactly what it looks like. And that is what makes things a little bit more complicated and we have developed ... this field of the liquid biopsy have developed many different approaches of trying to find these cells. There's a lot of really foundational work that was done by people like Massimo Cristofanilli and Dan Hayes when they originally showed that it actually matters. So step one was build the technology and then step two was show that it actually matters what you find and that was what was their initial breakthrough really. And that motivated many of us to really dedicate our lives and our careers to this framework of now going from it matters to getting to a place where if acted upon, it makes a difference. And this is this really critical stage that we are in right now in this current running ... call this couple of years ... call this a decade. To really demonstrate that we can find these cells, we can characterize them to understand the disease itself, and we can establish decision points that if acted upon, provide better outcomes. And that has just been ... it's been complicated because you have to work between the clinical teams and get their intellect, their input, their insight. The engineering teams to build the technologies. The biology teams to give us ideas of how this actually could hang together on the biology side, but then all the way into really regulatory ... into regulatory and reimbursement because, again, unless you can move this all the way through into routine use, you will not make a difference. Chris Riback: And so is part of the challenge ... are you looking for new bio-markers? Are you trying to understand how to get ... what does it mean when the CTC's, the circulating tumor cells, are not in the blood draw? Does that mean that they are not present or does that mean that you just drew blood that does not have them? I think those are kind of two different questions, but when you talk about the actual work that you're focused on in these years and maybe over the last decade or so, is it about finding those biomarkers and making the greatest usefulness out of the blood draws? Where's the real work being done right now? Dr. Kuhn: Absolutely. Those are very important questions and they again, they fall into both of these categories. One being are these cells, they are yes/no. And then B, if they are there what does that mean for that patient and for the current treatment and for the future treatment? And so being there, yes/no we have learned that, that is of very important prognostic power. So that simple part of you have cells means that you have a worse prognosis compared if you do not have cells. Now, that's okay. That's good information to have, but then the next step is really to say, "Okay, if you do have cells, what does that tell me about your particular disease?" I'm going to switch briefly over to the prostate cancers because they are actually Howard Scher and colleagues have over those past 12 months, published demonstrated that in fact the antigen receptor as the most common target in prostate cancer can be followed with the liquid biopsy. You can identify the exact time point when resistance to the existing therapy occurs and that switching to a chemotherapy is, in fact, provides better outcomes for these patients. And so this is what I mean by if identified and characterized and then acted upon, you can provide for better outcomes for these patients. And this is exactly the model that we all have to now follow on and say, "Okay, in breast cancer what are the decision points that we need to study? What are the clinical trials that we need to run to first characterize that decision point and then really identify this if acted upon provides for better outcomes." So that is very much the ongoing work right now in our own effort really characterizing that disease at every one of those decision points. Chris Riback: You know, in these conversations that I'm so fortunate to get to have, it always strikes me. I hear it very frequently the benefits of understanding, thinking about, and trying to extrapolate lessons or findings from one area of cancer to another. And how they don't always work. They don't always translate. And what you're finding in the prostate cancer research that you just described, maybe that will certainly inform thinking in terms of the breast cancer research and maybe something will be found out of that and then maybe it won't but that cross-disciplinary thinking is really a fascinating consistent trend that I hear in talking to scientists such as yourself. Maybe you can extrapolate on that for me. You were trained as a physicist. You have talked, in this conversation you've talked about the engineering team, the biology team, other scientific groups. How do you get folks from different disciplines? Is that the ... you clearly do feel that's the best approach, having people come at a problem from different vantage points. Why do you feel that way? How do you get the folks to work together and what's that energy like? Dr. Kuhn: Yes, so that's, again, another one of those really important topics right where ... there is a certain set of questions that we feel can only be asked if we actually all come to the table. There's certain questions that can, in fact, be asked and answered within a particular discipline. And that's great. If you can do that, that's perfect. But then there are other questions that really require all of us to work together and we are living and breathing what we call convergent science here at USC when we joined here. We joined here for that very, very reason. And when we think about convergent science, we think about wicked problems. And the wicked problems where sub-optimal solutions currently exist. Now again, breast cancer one can absolutely argue that we do have solutions, but they are not yet optimal, right? And if solved, it will make a global impact on society. Again, if we can solve some of these big problems in breast cancer treatment. We will actually be able to have a global impact on society, but the challenge is that neither the problem nor the solution space is owned by a particular discipline. And now that means that puts certain challenges and problems in front of us in terms of how do we set up a research team? How do we set up that research enterprise and that is where we are going in and we are saying, "You know what? Let's take these silos that we have, the clinical silos, just as much as the scientific silos and convert them into pillars. And then bridge across them." Right? Because we want to make use of this deep, deep knowledge that exists within each of these pillars of knowledge. And then bring these aspects together. And this is just something that we have seen a lot of success in, in the past and maybe being trained as a physicist, we are just very, very used to having to think about large scale research problems and large scale research enterprise team science set ups. And with that it becomes quite natural to work in that framework, so for example you mentioned the cross fertilization. So when we first started mapping cancer progression mathematically, we actually did that work between a faculty member, Paul Newton in Aerospace Mechanical Engineering and Dr. Larry Norton, over at Memorial Sloan Kettering because he is on the clinical side. The individual thought is so deeply about how cancer actually progresses through the human body and how it actually is not a uni-directional process, but it's a receding and self-seating process. It's a trafficking process. And so Dr. Norton allowed us to really think through it from the clinical perspective, which we cannot. Right? Because we're just scientists, but we were able to come in with a set of mathematical models that he was now able to say, "Oh, wow. Okay, this is completely consistent with what we are observing in the clinic." We took that knowledge and we first applied that, in fact, to prostate cancer because it's the simpler of the two diseases. It's a lower entropy, higher predictability. And now we're going back across into breast cancer and we start understanding that, in fact, a breast cancer that is first metastasizing to the bone is actually a different breast cancer from one that first metastasizes to the liver. So, again, something that once we start thinking through that, we're thinking of this time resolved. This time/space continuum of the disease and the implications of that. We have to get a handle on that. We have to get a handle on that question. It has to do as much with the clinic as it has with the biology, as it has with the engineering and the physics. Chris Riback: Well, it's fascinating and if nothing else, the ... I know you're not a TV guy, but the tagline “Practicing Convergent Science to Solve Wicked Problems,” that's a pretty good description. And yes, bringing that cross fertilization ... I'm hearing that quite often as well. It really seems to bring fresh ideas and fresh thinking in looking at these problems from multiple dimensions. Just to close out, tell me ... two questions, I guess ... one, you. How did you ... for you, kind of growing up and I guess you're from Germany originally, was it always science? Did you ever have ... did you know from an early age that this is where you were headed or did something happen along the way that threw you into this field? Dr. Kuhn: Yes, so I grew up in Southern Germany, down in Bavaria on a fruit orchard and always wanted to be an engine designer for Porsche. My father was a bit hesitant because he didn't quite understand why I needed to leave Bavaria for that. Why not work for BMW? That seemed a much better choice for a physicist at the time, but then my mom got diagnosed with breast cancer and even though I didn't really appreciate it at the time, but it had a profound influence on my entire thinking because I grew up for that decade of living through that with my siblings and my parents, of this constant anxiety. This constant unknown and that in the end, I think, is what then started driving my thought process of "Hey, wait a minute. How can we actually change that?" And that took me awhile to realize that, in fact, an observation or an experience like that comes with the responsibility of actually trying to change it and with that comes the recognition that, "Hey, you know what? What if every Monday morning at 5 a.m. when you wake up, you think about how can you make a difference on the outcome for patients?" And then with that comes a series of incredibly lucky coincidences where I found, initially at Stanford and then down at Scripps Research and now here at USC, the institutional commitment to actually advance the field and enable us to really move forward and closer to patient impact. And even though I'm just trained as a physicist, it does allow you to step back and think about the problem a little bit differently and this wasn't quite clear a decade ago when we ... or a decade and a half ago when we started that space, but seeing today being the time that the initial technology that we built is now actually being used in prostate cancer care, is just an unbelievable experience, I have to say. So it starts coming full circle and it starts becoming the obvious way to go and that is certainly something amazing to see. Chris Riback: That would make one feel terrific not only at 5 a.m. on a Monday, I'm sure, but just about every day. I'm sure it inspires you and has inspired you to then want to move on to the other cancers and, as you indicated previously, moving on to an area like breast cancer where there may be some treatments and solutions, but not always fully optimal ones. And BCRF, what role have they played in your research? Dr. Kuhn: BCRF has been both a guidepost, as well as incredible supporters of this work, of course, because when we started in breast cancer a number of years ago now, we were the new kids on the block and so we needed help, so we reached out for help. 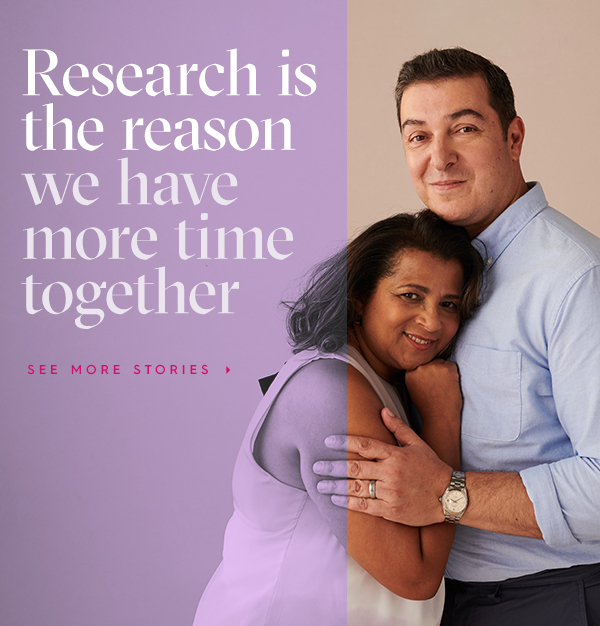 We reached out for insight and education and from that time period onward, really BCRF has been our primary driver of everything that we have done in breast cancer now. It's been an amazing, amazing collaboration all the way to the work that we are now doing together with Colonel Shriver from the Murtha Cancer Center down at Walter Reed where we are actually, for the first time, following a group of women with metastatic breast cancer and we are characterizing them with the liquid biopsy, but in fact, not just our technology, but for the first time we're doing a concerted effort of four competitors, really five competitors. Five competitors in the liquid biopsy space getting together and saying, "You know what? Let's collaborate to compete. Let's collaborate on trying to understand how this disease has actually evolved and then learn from that. So let's step away a little bit from our own favorite technology." And we all are tech developers, right? So, we can't help ourselves. We love to stuff that we build, but we have recognized that breast cancer is just ... it's complicated. It's hard. It requires our entire devotion and dedication to that and we have to do this together and BCRF stepped up to the plate and said, "You know what guys? This is exactly the right thing to do. We are coming in with you. We're sitting with you at the table. And are supporting you in that program." Chris Riback: That's terrific. Dr. Kuhn, thank you. Thank you for your time and thank you, obviously and most significantly for the work that you and your colleagues have done and are doing. Thank you on all fronts. Dr. Kuhn: Thank you, Chris. It's been a great pleasure. To learn more about breast cancer research or to subscribe to our podcast, go to BCRF.org/podcasts.